The Gucciest Sneakers Thus Far — EveryStylishGirl. Gucci has been the latest powerhouse brand to hop on the chunky sneaker trend with the release of its new Apollo sneaker from the Cruise 2018 collection. Made in Italy, this off-white leather lined sneaker will set you back $820 if pre-ordered now, and will arrive sometime in May. 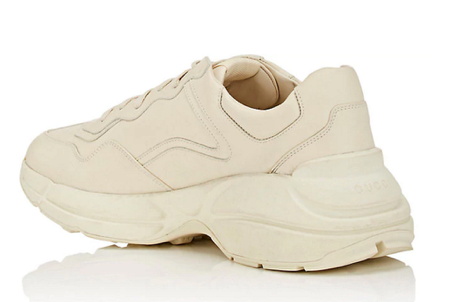 While the material of this sneaker is luxurious the shoe doesn't feature much in design compared to its predecessor; the Balenciaga Triple S that’s sleeker and offers more colorways. The Apollo has a huge Gucci logo in the middle and Gucci font printed 4x on all four sides on the outer sole while solid in color on the inner sole. The sneaker has received a ton of recognition for having “street style” and being “instagram ready” but with its gaudy logo one has to question are people loving this shoe because it’s actually fashionable or because its designer? Due to social media there is a need to purchase status symbols in an effort to be deemed stylish and trendy because of the brand and not the product. Referencing an Investopedia article on the matter, consumers purchase things in an effort to show off or gain acceptance from others. Nowadays “others” are social media followers, and the recognition they give for knowing about such brands, and being able to afford them is likes, shares, and more followers. Graphic designer Romano Dudaš photoshopped the Supreme logo off of popular Supreme items on his tumblr page Regular Products to illustrate that Supreme products are just like everything else. Supreme fans agreed that when deprived of the famous logo certain items were in fact regular. While Gucci is a premier brand and should be recognized for its excellence, its safe to assume the Apollo sneaker is an instant hit because of its double G’s and soon to be instagram popularity. Here are photos of it before Gucci updated it with the logo.